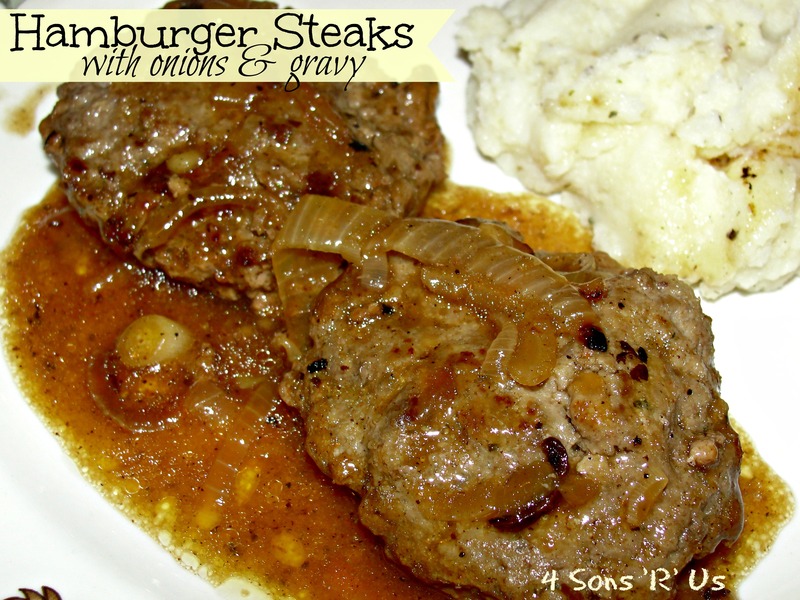 I’ve had Hamburger Steaks (aka Salisbury steak) before, but I’ve never really liked it. I thought I just ‘wasn’t a fan’, but then I got to thinking. I love meatloaf. I love gravy. Something was always missing for me…flavor. On a whim, I decided to try my own hand at this classic dish. It still seemed like ‘Mission Impossible’. After my family’s first bite, we all agreed: Mission Complete! Not only were the ‘steaks’ jam-packed with flavor, but so was the simple gravy. And where can you go wrong with caramelized onions?! Take it from me, serve these juicy ‘steaks’ with mashed potatoes. You won’t want to waste a drop of gravy. 1. In a large bowl, mix together the ground beef, egg, bread crumbs, pepper, salt, onion powder, garlic powder, Worcestershire sauce, and steak seasoning. Form into 8 balls, and flatten into patties. 2. Heat the oil in a large skillet over medium heat. Fry the patties and onion in the oil until patties are nicely browned, about 4 minutes per side. Remove the beef patties to a plate, and keep warm. 3. Sprinkle flour over the onions and drippings in the skillet. Stir in flour with a fork, scraping bits of beef off of the bottom as you stir. Gradually mix in the beef broth and sherry. Season with seasoned salt. Simmer and stir over medium-low heat for about 5 minutes, until the gravy thickens. Turn heat to low, return patties to the gravy, cover, and simmer for another 15 minutes.